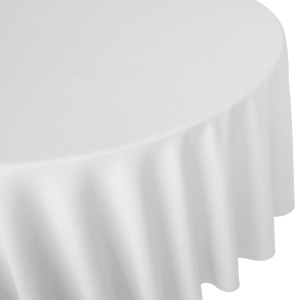 Our popular round table linen covers the table and drapes elegantly to the floor for a stylish and professional effect. The white linen is the perfect background for a daring and vibrant colour by adding a table runner or contrasting napkins. Linen sizes are available to fit 4ft, 5ft, 5’6” and 6ft tables in both white and a variety of colours.